As I was nearing the completion of this painting, I was having trouble coming up with the title. Then it came to me, "Leopard!" The first thought that would come to you when you saw him, and being this close, probably your last thought. I find leopard, cheetah, zebra, and giraffe paintings take me the longest. Spots and stripes. As you can see, this piece is no exception. Yes, this piece is going to take a while. 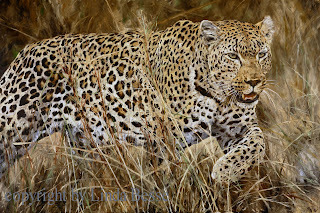 Once I put in some deep background, the next and most important step is the leopard's eyes. To stick with that "in your face" leopard, the eyes had to be looking right at you. An interesting thing about eyes and painting. If you paint eyes looking directly out at the viewer, they will seem to follow you no matter which angle you view the painting. That is what I wanted for the leopard. He wouldn't be taking his eyes off you. And, you should be worried. Here I have finished with the turpentine wash on all the spots. (Whew, a lot of spots!) While it may take a while to do this step, I find it worthwhile in the end. The burnt sienna - raw sienna wash adds a warm glow and I let it peak through subsequent layers. It will be subtle, but I find it acts as a unifying color throughout the piece.